« Service of Storage: Good or Bad Idea? 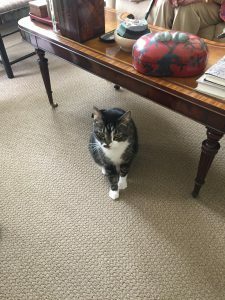 This entry was posted on Thursday, April 11th, 2019 at 11:21 am	and is filed under Animals, Cats	. You can follow any responses to this entry through the RSS 2.0 feed. You can leave a response, or trackback from your own site. My cats have always come when called and have cuddled. At the moment, I have one cat left (I had three at one time. ), and I plan to replace her when she goes to cat heaven. She frequently gets on a chair next to my computer to be petted, and she also gets on my bed for the same reason. Cats are ideal companions for elderly people since they don’t need to be walked and use a litter box. I agree they do and can show love to their owners. My cat also tells time, demanding her food at three specific times of the day. Right now, she is next to me loudly purring as I pet her. I don’t agree with the Wall Street Journal article. I think cats have gotten a bad rap! Cats are also perfect for people who leave for work early and return from work late. I think most of the negative press cats get is from people who haven’t lived with a cheerful or intelligent feline or perhaps know nothing about them. I was wary when I first encountered Cat. He was strolling on a fence. The previous owner assured me that Cat was gentle but he also told me that he swam in the pond which was hooey–it was filled with snakes and goodness knows what else and throughout a very hot summer–he rented the guest house–never once did he put one toe in that water. I touched Cat very gently and he leaned in to be petted. It was curiosity on my part at first sight. That turned to “where is he? 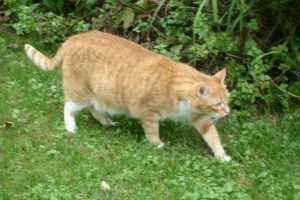 we didn’t see him all weekend,” and eventually, he became a beloved indoor outdoor cat. I happen to love cats. Whenever I announce this to certain people I often get a response that startles me. How about, I am a dog person and I really hate cats. How some people can just blurt this out without thinking about hurting my feelings is beyond me! I never say I am a cat person but I hate dogs. Frankly, I like most animals much more than most people I have met in this life. Animals never say the wrong thing! I am blessed to have known Snowflake, Spooky, Josette, Angelique and Rosie wherever you are. Please return soon! You make a good point. When I had dogs never once did someone walk up to me and say, “I hate dogs I only like cats” yet people are comfortable insulting cats and their owners. Hmmmm. I am grateful to Spooky as he introduced us to you and John. 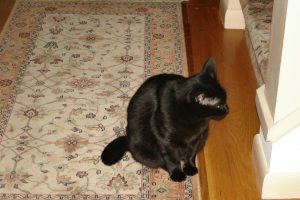 I chose Josette’s photo to illustrate this post because she honored us with her presence that night when she is usually timid and doesn’t set nose or paw in the room when guests are there. I, too, hope that Rosie will visit again once warm weather sets in. You are great cat parents–they have the best life with you and she’d be a lovely addition to the family. Severely allergic to cats; otherwise, I like them! I look, but do not touch . Cats allow people to live in their CAT environments. BC–There was a time my husband thought he might be allergic to one of our cats. He wasn’t. Such a shame not to be able to pat a cat or let it zonk out on your lap when you watch TV. I will not take sides in cat v. dog issue, but the almost identical article ran in the London Times 2 days ago. Assuming a press release was sent out to major newspapers, or someone sharp-eyed US reporter saw it and followed up. Or maybe posted to a social media site? It’s such a relief to write about a cheery subject these days. I think I saw coverage of the study on Facebook and no doubt it made the rounds on Twitter, Instagram et al. Not surprised others grabbed on to it. 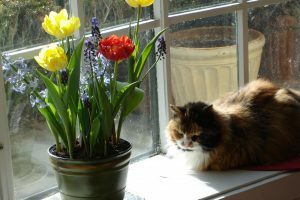 There are as many cat theories as there are cats, if not more, so why bother with analyses? In all probability all apply in one way or another. Cats are independent creatures with the strong possibility of feelings based solely upon themselves. “Cats are mysterious folk,” according to Sir Walter Scott. So let’s respect their privacy and enjoy them for who they are! Same with dogs I suspect. I knew a woman who had dogs her entire life whose dog attacked her consistently and eventually had to be removed from her home. She was in her 80s, could not control the animal–nobody in her family could. It was a stunning English setter with a mean streak. As for kitties, here’s to Sir Walter Scott!